Civis Analytics, founded by Dan Wagner, the former chief analytics officer for President Obama’s 2012 campaign, has rolled out a set of big data tools through Amazon Web Services. The year-old Chicago-based firm says it can eliminate much of the time and cost associated with marketing campaigns, in particular using cloud computing but without the need for customization. The service will start at about $5,000 a month, which Wagner claims will be “80 percent cheaper in most cases” than competing services. The company’s AWS Redshift data analysis service handles big data tasks and can deliver information within 15 seconds of uploading the data. Google executive chairman Eric Schmidt, who is one of Civis’s board members, as well as an investor in the company, notes that the kind of analytics provided by Civis is likely to impact much of the advertising and marketing business. “If you need to find 25-year-old Hispanic males who are working and have one or more children, they can find you a set,” he said. These are not the only companies trying to automate data science and make it more accessible. 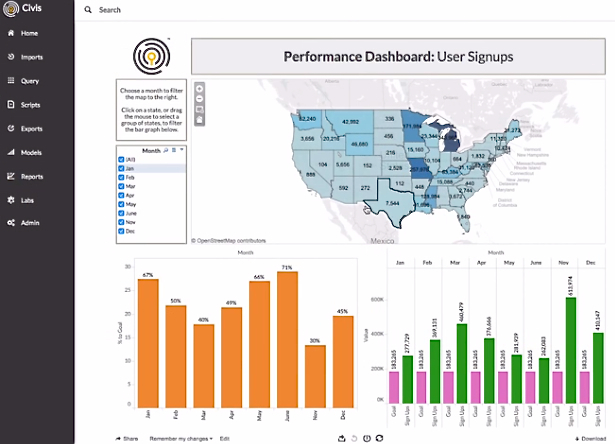 The New York Times singles out Tableau, which focuses on visual consumption of results, and ClearStory Data, which creates multi-step data journeys. Before Civis launched a year ago, Ethical Electric, a clean energy vendor to 70,000 customers, used an earlier version of the company’s service. Its vice president for data services says Civis Analytics did the work of at least three engineers and put them a year ahead of its plans. Other customers include Airbnb and Boeing.